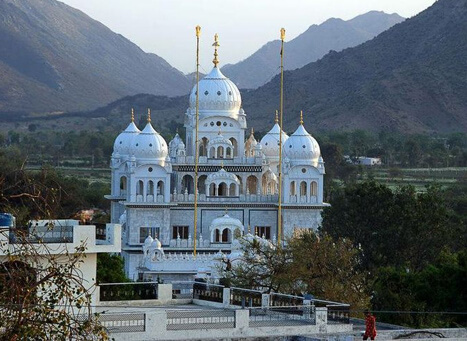 According to the history, this place was visited in the past by the two most famous Sikh Gurus – Guru Gobind Singh and Guru Nanak Dev during their travel to Rajputana States in 1706. They were served by the priest Chetan Das that time. The place where Guru Gobind Singh, the last Guru of the Sikhs stayed was known as Gobind Ghat which was renamed as Gandhi Ghat. There is a stone slab inscribed as Gobind Ghat under a kiosk in four different scripts i.e. Devanagari, Gurumukhi, Persian and Roman. There is a hukamnama inscribed on bhojpatra which states that it was presented to priest Chetan Das by Guru Gobind Singh, which is still in possession of the serving priest here now. The main priest also possesses a handwritten copy of Guru Granth Sahib – the religious scripture of Sikhism. 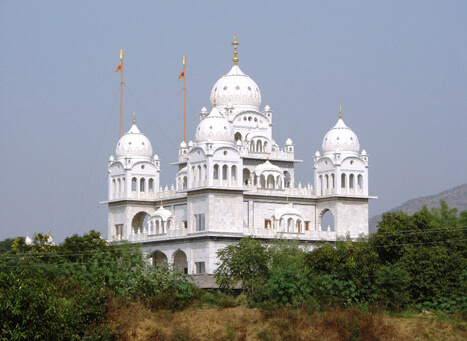 Gurudwara Singh Sabha is a subsidiary of Singh Sabha in Ajmer and is located near the bus stand in Pushkar in a beautiful double storey white building. 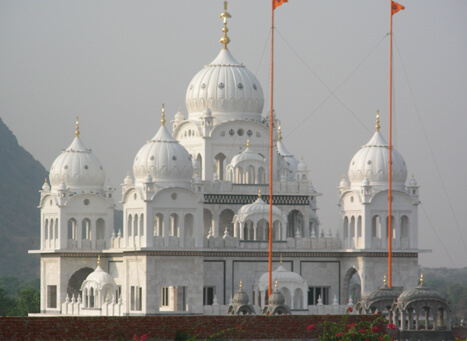 You can visit Brahma Temple, Man Mahal, Shri Sawai Bhoj Temple, Savitri Temple while your visit to Gurudwara Singh Sabha. Famous Khwaja Moinuddin Chisti Dargah in Ajmer Sharif is another must-visit place to get your wish fulfilled. Gurudwara Singh Sabha can be visited anytime as per the convenience and depending on the weather conditions. For pleasant travelling, winter is the best season in Rajasthan. Pushkar is 13 Kms from Ajmer and can be reached easily via road, rail and air. 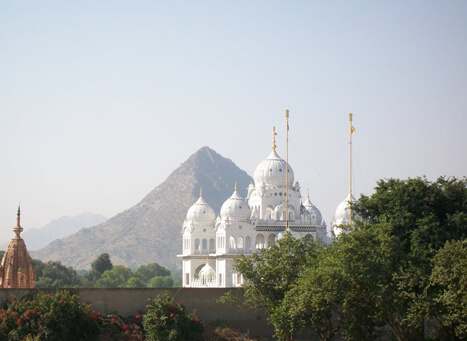 You can reach Gurudwara Singh Sabha by road after reaching Pushkar. Pushkar, also known as Tirtharaj is situated beside the famous Pushkar Lake. It is also called Temple Town for its well known Brahma temple and other beautiful temples all around, which holds great attraction amongst the Indian as well as the foreign tourist.